In The Kitchen With Lupo Verde: “Green Wolf” Cucina & Bar Now Serving Brunch | Exploring Food & Drink in D.C.
To get the brunch ball rolling we obviously had to start with a cocktail. 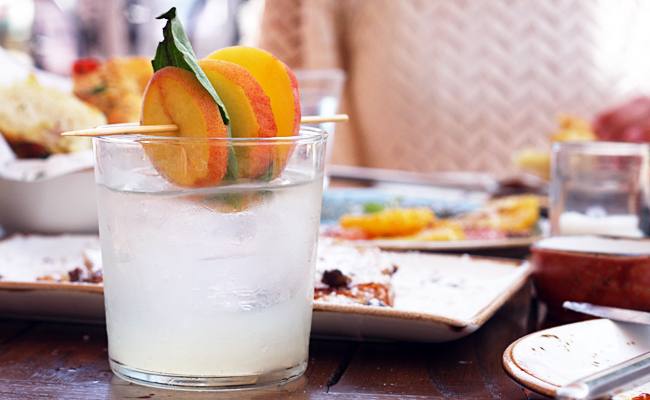 Lupo Verde’s brunch menu contains five cocktails, none of which are your typical Bloody Mary or Bellini. 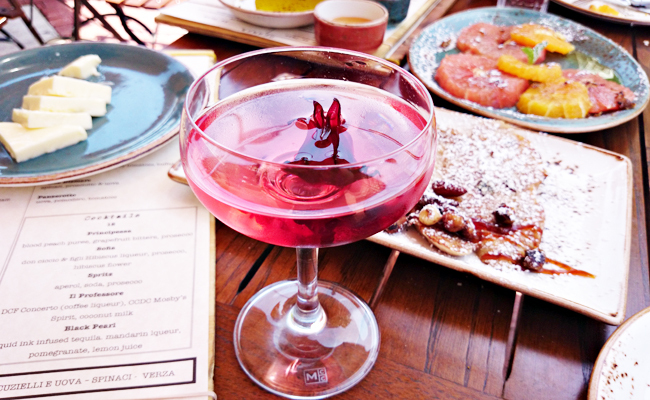 In fact, the closest thing to a Bellini was the Principessa (blood peach puree, grapefruit bitters, prosecco). If you’re more adventurous and hard-core when it comes to brunch cocktails, the Black Pearl (squid ink infused tequila, mandarin liqueur, pomegranate, lemon juice) is one drink lively enough to waken those hungover taste buds. However, it’s the Sofia (don ciccio & figli Hibiscus liqueur, prosecco, hibiscus flower) that soared to the top of our list as far as favorites. In addition to the brunch cocktails we took a detour over to the regular bar menu for a sampling of another four cocktails including the Rosso Si Sera (peach whiskey, Limoncello, cherry syrup, celery bitters), Ramona (tequila, mandarin liqueur, watermelon, blueberries, lime juice), Toto’ (gin, cocchi americano, peach, basil, lemon juice), and the most popular of Lupo Verde’s drinks, the Lupo Alberto (rye, fennel liqueur, fennel bitters, strong tonic). The Ramona and Toto’ cocktails are refreshing, perfect for the hot months of summer, and ridiculously light with almost no alcohol taste. We were warned that these are sneaky drinks and after a few one might find themselves tripping over their feet and landing face first on the sidewalk. We were genuinely impressed with the skills of the resident mixologist and wide variety of beautifully-crafted drinks. The food portion of our meal began with bread service of fresh, put-in-the-oven-at-9am focaccia that we swear must have been made by little kitchen cherubs or elves. Then the Sugar Plum Fairy dropped off Cestino di Pane – a basket of five different “sweet breads” containing Fagottini al Cioccolato (brioche with chocolate & hazelnuts), Zeppole (sugar donuts), Cornetti (Italian Croissant), Panettone alla Strega (mini muffin flavored with Strega), and Girelle (candied fruit and crema pasticciera spiral). Next, out came the Carpaccio di Agrumi (grapefruit and orange carpaccio, cinnamon, sugar) and a plate of Pane N’Zuppato (French toast made with Italian brioche, pearl jam and mixed nuts.) Although delicious, we think whatever stomach room you have left is best reserved for something other than the Carpaccio di Agrumi. 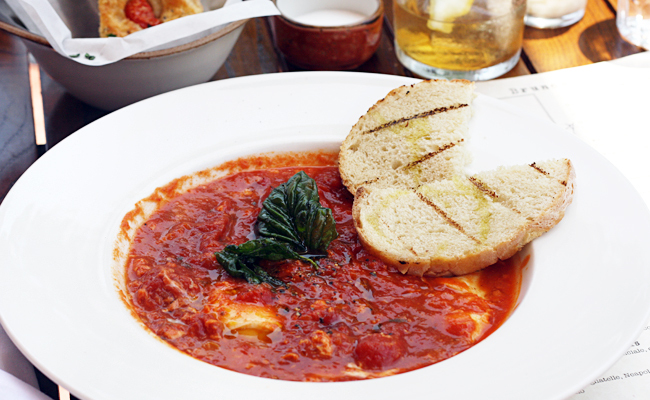 It’s simple, beautiful, but something we could make at home for much less than the dish costs at Lupo Verde. However if bruleed citrus fruits are your thing, more power to you. 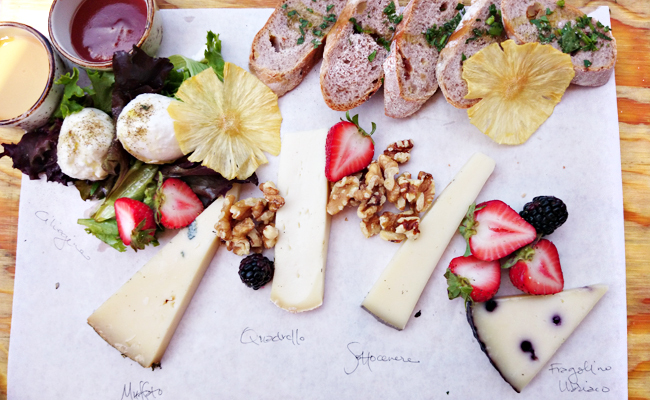 We do think ordering a selection of Caseificio (aka dairy) is a much better option. With about 25 cheeses to choose from, we can personally suggest the Ciliegine di Bufala (soft buffalo), Muffato (soft, semi blue), Sottocenere del Piave (semi-hardtruffled), Quadrello di Bufala (semi-hard buffalo), and the Fragolino Ubriaco del Piave (hard, aged with wine), served with fresh berries, nuts, honey, pearl jam, and raisin bread. One can’t dine at an authentic Italian restaurant without at least sampling a minimum of one pasta dish. 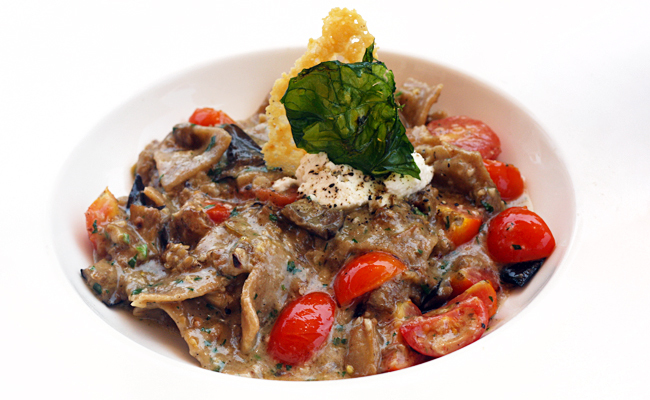 And, although our stomachs hit a wall during our brunch marathon we decided to try the Maltagliati alla Norma (homemade malatagliati, ricotta, eggplants, cherry tomato, parmigiano) all in the name of training for the food Olympics. (That’s a thing, right?) One of the most interesting pasta dishes we’ve ever had, the pasta itself is made with bread crumbs, with a flavor that is hearty, earthy, and richly decadent while not sitting too heavy. We were thrilled to learn that even our Celiac and gluten-sensitive friends can request any of the pastas be prepared as gluten free. 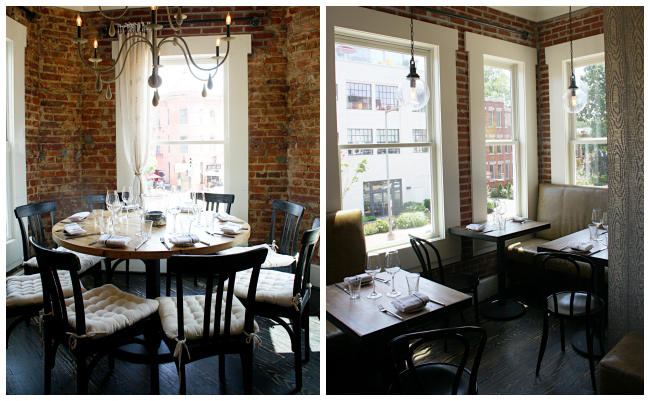 We adored both the interior and exterior of Lupo Verde’s dining spaces along with the smiling faces of all of the staff who appeared to enjoy their jobs. Between falling in lust with the food to the point where we were telling everyone who walked by that they HAD to eat here, and finding our soul mate in the exposed brick walls, twine wrapped light fixtures, communal dining spaces and unique wall papers, we couldn’t be any happier to hear that Lupo Verde, four months in, is doing quite well. It’s recommended that large parties (8+ guests) reserve their table two weeks in advance, while regular reservations should be made a week in advance. If you show up on a Sunday or Monday you may just luck out with available tables. Or, you’ll risk being put on a wait list up to an hour and a half long. It’s really a no brainer. Make a reservation. 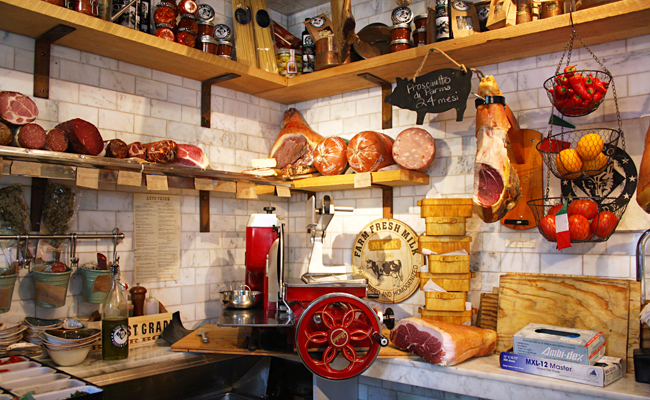 In the coming weeks Lupo Verde will be opening up their meat & cheese room to the public where customers will have the opportunity to purchase pastas, pearl jam, caseificio and salumificio. Guests can also purchase branded glassware and t-shirts. 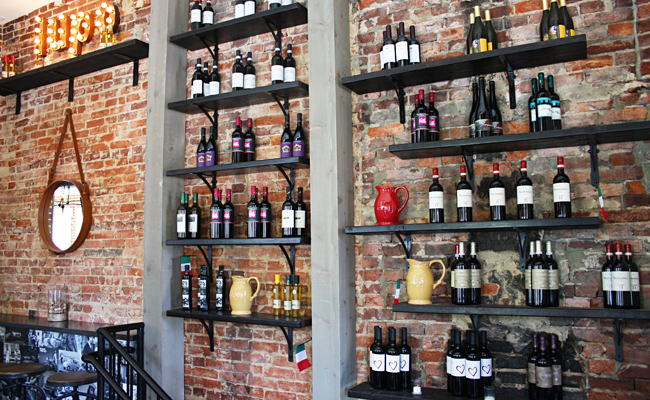 We think we need to get our hands on some of that glassware. Rebekah spent much of her childhood on the coast of Maine where she cultivated her affinity for local seafood. Her lust for traveling extended beyond her New England borders and so she spent time traveling to Nepal, Mexico, Canada, Puerto Rico, and various parts of the U.S. before taking up blogging and spawn rearing as her full time gig. A transplant into the DC Metro Area, she has a newfound enthusiasm for gastronomy, and finding the best indulgences in the District. Rebekah's photographs and writing have been published by various media outlets, however her love of adventure would find her constantly on the go exploring new places and cuisine. Tags: Antonio Matarazzo, authentic, Domenico Apollaro, Gluten Free, Italian, Lalou Group, Lupo Verde, Med Lahlou, Washington D.C.. Bookmark the permalink. I am an Italian and love restaurants where I can get authentic food (the Olive Garden is definitley not that)! I’m with Robin on this one! THat egg dish sounds AMAZING! I could also go for a good bloody mary right now! This sounds amazing. I could go for all of this right now. Yum, the dishes in the photos look amazing! 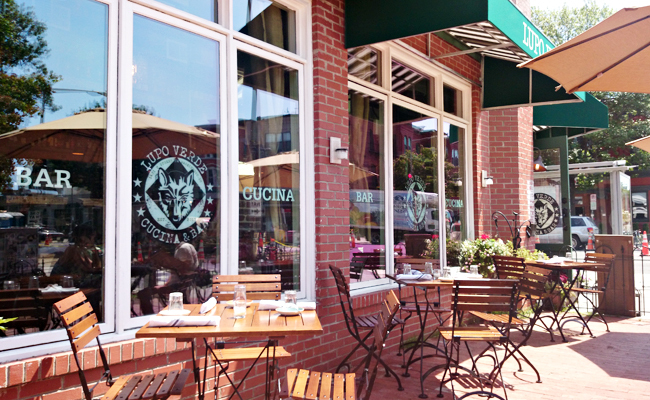 I’d love to visit Lupo Verde next time we’re in DC! Sounds like a really interesting restaurant and menu. Those cocktails sound divine. Such a quaint restaurant…yumm. Wish I lived closer! That is so popular if you need to reserve so far in advance. It sounds TOTALLY worth it though. I love brunch and this place looks fabulous! Pingback: In The Kitchen With Lebanese Taverna: Innovative Summer Cocktails by The Menehune Group + From the Menu Recipes | Exploring Food & Drink in D.C.
Pingback: In The Kitchen With Station 4: Season by Season We Have To Help Our Farmers + Recipe | Exploring Food & Drink in D.C.
Pingback: In The Kitchen with Policy: Truth, Love, Liberty…and Brunch + Shrimp & Grits Recipe | Exploring Food & Drink in D.C.